· Defining Node: Node n € G(P) is a defining node of the variable v € V, written as DEF (v, n), if the value of the variable v is defined at the statement fragment corresponding to node n.
· Usage Node: Node n € G(P) is a usage node of the variable v € V, written as USE (v, n), if the value of the variable v is used at statement fragment corresponding to node n. A usage node USE (v, n) is a predicate use (denoted as p) if statement n is a predicate statement otherwise USE (v, n) is a computation use (denoted as c). · Definition use: A definition use path with respect to a variable v (denoted du-path) is a path in PATHS(P) such that, for some v € V, there are define and usage nodes DEF(v, m) and USE(v, n) such that m and n are initial and final nodes of the path. · Definition clear: A definition clear path with respect to a variable v (denoted dc-path) is a definition use path in PATHS(P) with initial and final nodes DEF (v, m) and USE (v, n), such that no other node in the path is a defining node of v.
· A variable that is deﬁned but never used (referenced). · A variable that is used but never deﬁned. The du-paths and dc-paths describe the flow of data across source statements from points at which the values are defined to points at which the values are used. The du-paths that are not definition clear are potential trouble spots. Hence, the objective is to find all du-paths and then identity those du-paths which are not dc-paths. This is known as DU testing Strategy. In this strategy, chance to cover all edges of the flow graph is very high; although it does not guarantee 100% coverage. This is also effective for error detection specifically for DU-paths that are not definition clear paths. India is a big country and requires a sustained effort to take care of its enormous defence and security needs. The defence of the nation or preparing for it cannot, however, be the responsibility of the three services only. Parliament and the entire people of the country have to be involved in it. The support from Parliament and the people can be enthusiastic if they are kept informed about what our forces are doing to accomplish the task assigned to them. The government’s defence information policy is unfortunately restrictive. While a major chunk of the national budget is meant for defence, Parliament, the press and the people don’t really know how wisely this money is spent. Parliament and the media can also be faulted for not giving due importance to defence and for their failure to put sufficient pressure on the government to give more information than it has been doing since Independence. Ignorance and a lack of understanding have thus marked the discussions on the defence-related issues in Parliament and the Press. The debates in Parliament on defence are as sketchy as the reporting in the newspapers. The government’s policy of giving limited information about defence as well as the failure of the Press and Parliament to bring defence under greater scrutiny can prove costly. Defence is one of the most important aspects of every nation. Before moving forward to Defence one must know what nation is? ‘Nation’ means ‘born’. People born out of the same race came to be known as a Nation. Any nation will be counted as powerful only if it has strong security forces. National security, therefore, implies the security of the nation as a whole. Thinking of security at the national level involves a combination of varied factors. It doesn’t remain confined to a single factor or aspect. A thorough analysis of geographic, political, economics, technological and strategic factors is required to be undertaken while considering national security. If law of any country is not strong then crime may increase. Similarly if the country doesn’t have enough arms then the country can’t be secure. However, just the arms only do not make the country secure but the public support also make them strong. Public support is ensured when it is adequately informed. Though all the planning can’t be available for public due to safety point of view, still news items related to Defence do appear in newspapers. During a time of moment worldwide correspondence, governments have refined their open strategy; especially in the manner in which defence issues are shrouded in the media, to advertise their variant of occasions successfully to their residential just as the universal public. For sure, numbness and falsehood are definitely more hazardous for the military than is informed reporting, however critical in tone. In any case, the media need assistance here. Since the press is divided, aggressive, now and again insensible of military substances, and continually whiplashed between the requests of the market and those of journalistic morals, however defined, the nature of inclusion of military activities or events is definitely uneven, best case scenario. The inclination of ill-equipped journalists, charging from emergency to emergency, unconscious of the issues in question or of how the military capacities, is to outline complex issues in shortsighted ways. As far as concerns its, the military owes access to data both to media and the Indian public. Besides, it needs to get its story out for the military will rival different groups, and foes, anxious to put their "turn" on occasions. To do this, it needs the media. The government and the armed forces are still ultra conservative about defence information in India. The deep divide between the armed forces and the average civilian debars them from the understanding of the defence of the nation, which is the necessity of the day. To bridge the gap, the press in India, today, needs greater insight into the requirement of defence services and the facts which a reader wants to know from them. After all, news pertaining to defence cover important and major portions of our newspapers. To bring to light the subject in both its pros and cons, neither an army general nor a general reporter can suffice the purpose. This is where a specialist defence journalist steps in. The comprehension and backing of educated natives is the premise of public trust in the military. Such certainty is fundamental to the successful execution of their military mission to preserve peace and repulse animosity. People in general have to right to complete information about the plans and advancement of the military, subject just to constraints of fundamental security. A learned and unflinching citizenry is as imperative as an exceptionally energetic military force in meeting an animosity. Public comprehend of the consistently changing military circumstance is reliant upon truthful and current status of their defence force. And this understanding can be got about only by an efficient defence journalist. In India, as elsewhere, the public understanding of the activities of the armed forces is also essential in overcoming the traditional resistance of public to a large military establishment. The need for a strong military force and the funds to support it is not universally accepted by the public. There is a natural desire on the part of tax payers to reduce expenditure on defence. The interest of a military service as a career is not valued by many young men and women. These reasons further emphasize the importance of defence journalism and role in keeping the public informed of the contribution of the services to the peace and prosperity of the nation. The expectations of the public from the media to be its eyes, ears and brains in matters of supreme importance for the stability and life of the nation, are fulfilled by the specialist defence writer. The defence of India is vital to the lives of millions of men, women and children, to its existence as a nation and to the people of all countries allied with us in the preservation of the freedom throughout the world. Hence it is very essential to feel the pulse of its public on issues pertaining to the armed forces. What does the common man feel about the giant corporation owned by over 900 million citizen shareholders, who are investing their rupees as tax in equipping and operating this largest enterprise in the country? Not only has the Indian Public its billions at stake in the business of national defence, but thousands have also chosen to make substantial investments of their time and effort serving in the armed forces. So don’t they play an important role in nation building? If they do, then it gives them the right to get an insight into what is actually ‘Defence of the Nation’. But this is not the end of the story. In a field where every step forward is followed by two steps backward, it is very difficult for the defence writer to come out with a write up on his own. In the defence set up, where censorship reigns supreme and the press is treated as an unnecessary encumbrance and a necessary evil, to be a good investigative reporter and a prolific writer is not sufficient. Cooperation from the Ministry of Defence and its various establishments and formations is absolutely essential. So perform his duty of bridging the gap between the armed forces and the public, the press correspondent needs the defence sources to be more communicative. Keeping this in mind and to propagate authentic and objective defence writing, Ministry of Defence, Government of India, has established a Directorate of Public Relations. Official information on matters related to defence policies, goals and interests is provided to the press by its headquarters at New Delhi and the various public relations officers stationed at cantonments and command headquarters. In Contras, civilians who write on military matters have shown more imagination and perspective than our intellectual generals. The defence journalist has a very significant role in building up the society’s trust in armed forces. Since understanding the basis of trust, the writer can foster this through his writings which enable people to understand the various facets of defence. It costs money to make money! The backbone of any business is finance. To survive in this competitive world every business needs adequate finance to meet all its requirements. In olden times finance is needed either for acquiring capital assets i.e. to purchase furniture or for the creation of a new office /factory etc or for manufacturing of a new product. . Usually, such manufacturing are funded by internal sources, while funds required to purchase fixed assets are arranged from external sources. But, in today’s scenario the requirement of finance has been changed. Today , we not only require finance to buy machinery or to develop a new product or to construct the building but finance is also required to buy materials or stock (the goods that are to be sold), to Carry out some market research and do other types of marketing or to move into new markets etc. The funding of any project/trade is the most basic feature of its management. If the business is able to fund its project in the right manner, then the business will grow in the healthy manner with more cash inflows and more profit. The requirement of funds can emerge at any point of developing business. Funds are required at the time of startups and even at the time of expansion. Therefore, we can say that finance is needed throughout a company's life. The funds for the business can be raised by various ways. The kind of business plays an important role in deciding the type of funds required. The big organization will be requiring a large amount of funds as compare with the smaller organizations. Smaller organizations can even use their retained earnings i.e business can be funded with the help of internal funds only. Smaller organization require less amount so they can even borrow from their friends and family members where as the bigger organization require a huge amount of finance so they can go for a bank loan, borrow funds from the financial institutions or even borrow from the general public by issuing shares and debentures. 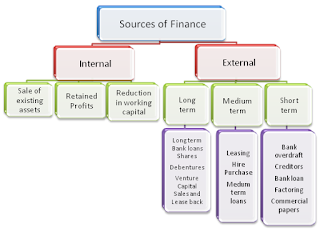 Ø 1.1Internal source of finance. 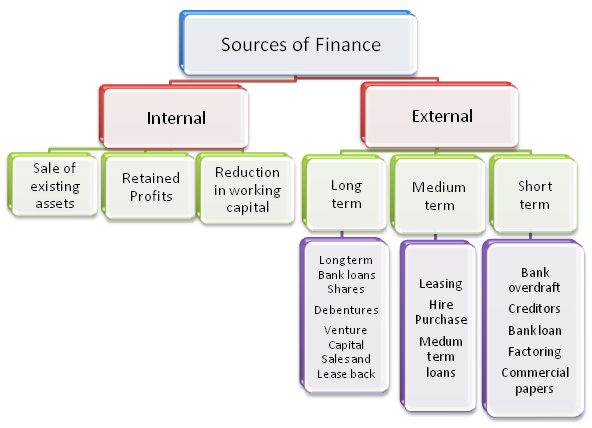 Ø 1.2 External source of finance. Ø Retained profits: Retained earnings are that part of the profit which is earnerd every year but not distributed to the shareholders. It is also known as reserves or ploughed back profits. In the long run such amount can used for funding the business. Ø Reduction in working capital: Reduction in working capital means reducing the level of inventory so that some additional cash can be raised for business. Growth has been taking place in our economical , social and business mankind. Then what was the need of the concept ‘Sustainable Development Growth’ or ‘Sustainable Development Goals'. Yes, of course, our irresponsible behavior towards our environment which led to various problem in the further times, we had been using or planning everything regarding development without giving a second thought about its future consequences. We had been completely ignorant about the future demands. All that we were concerned about was its immediate benefits. As the time passes by, realization come that this would lead to nowhere in future. It would be creating problems for themselves as well as the future generations. So, finally in the year 1980 International Union for the Conservation of nature talked about making ‘Sustainable Development’ a global priority. The question arises what do we mean by Sustainable Development. It means development taking place without depleting the natural resources. It also means development taking place in present without compromising the needs of the future generations. Here, one main thing that need to be cleared is people usually get confused depleting to not using these natural resources. On the other hand, it means not letting the resources Deplete i.e. the amount of resources we take from environment must be compensated by adding to the environment equally or maybe more to create a balance in the environment. Information Technology, Information technology in Sustainable Development Growth. As we all know the IT sector is growing really well as every now and then new technologies are discovered that helps us do our work easily. IT has the potential for intensive production, consumption, trade and services. Such changes can significantly reduce the environmental impact of industrial and commercial activities and thus contribute to SUSTAINABLE DEVELOPMENT. Today’s information society is being built on technology, knowledge and intelligence. Information Technology (IT) empowers both people and machines with information, which is transformed into knowledge and intelligence. Appropriate use of the knowledge by both people and machines contributes to sustainable development. As information becomes accessible to anyone, and anywhere, it is increasingly becoming a basic economic resource and a structuring factor in today’s society and hence a great source for sustainable development. One more reason of IT sector to be on top when it comes about sustainable development is Accurate and Speedy processing of Information. One can get information of abroad by sitting at his home. IT sector thus helps the environment to grow on a very fast rate and hence contributes in sustainable development growth. Information technology has removed the physical barriers between nations and connected them through their shared ideas and opportunities. The advent of social media has made interactions easy and the use of Facebook, Twitter, and all other social networking sites has drawn culturally different people to communicate with one another. People on the social media are now becoming ‘global’ citizens. Wireless communication has revolutionized the ways in which we communicate news broadcast. We can communicate anywhere whether its Delhi or New York. Today it takes less than a minute for a new story to propagate from one part of the world to the other. The rising demand of IT professionals across businesses is creating new opportunities every day. Several emerging economies all over the world are now setting new records by strengthening their competence in this field. A greater number of people are showing interest in jobs like computer programming, system analysis, testing. The emerging new influencer community is wielding significant power over the perceptions of brand and companies, largely driven by the expansion of social media channels through which influencer communicate. The “Nobodies” of the past are now the new “Somebodies” demanding the attention of communication professionals who seek continuous engagement with targeted consumers throughout the various channels of the social web. For mostpeople, social networking sites like Facebook and Twitter are harmless platforms .Platforms that allow for social interaction and personal expression. For other, social media has become more than an entertaining form of engagement; it has become an increasing compulsion. The question is that –Can a person really become addicted to social media? This is a notion that researchers are beginning to address, and recent studies suggests that YES, social media addiction is real. Addictions are after all about feeding an urge, and one of the greatest human urge is the yearning to feel connected and a part of something larger. Nothing satisfies this particular urge like logging on and being social with the masses at any hour of the day or night. Social networks are massively addictive. Most people I know check and interact on social sites constantly throughout the day. And they have no idea how much actual time they are spending on social sites. Desires for social media are difficult to control because giving in to these social urges seems far less harmful than giving into drugs. Being online is easier for people who suffer from self-esteem issues, and within this group, an addiction to sites like Facebook and twitter is much more formed. Are you guilty of checking your Facebook account before you get out of bed in morning? Do you tweet while on a romantic first date? You may think your own social media habits are harmless, but how do you know if you’ve crossed the line into an addiction? One way to check yourself is to evaluate your feelings about social media. For instance, when you don’t have access to it, say while on vacation or at an event such as wedding, do you feel anxious and can think of little besides what you’re missing online? Would it be an accurate statement to say that social media brings you the most pleasure in your life? If you answered ‘Yes’ to these question, then it might be time to address your relationship with social media. If you are a social media addict, and your addiction is getting worse, there’s a reason for that, most of the major network companies, as well social content creators, are working very hard to make their networks so addictive that we can’t resist them. When we think of addiction, the picture that normally comes to mind is that of a gaunt man or woman, huddles in a corner, trying desperately to get his/her next fix of heroin. But addiction isn’t just about substance abuse. If a person engages in an activity to a put where it comes compulsive and interferes with ordinary life, then as per Psychology today, that too counts as an addiction. One trick social networks use is a notification number showing the number of people at a glance who have mentioned or followed you. Notification number work just like that- Seeing a red “3” on Facebook notification bar is like a click bait headline “You won’t believe what three people said about you”. You’ve get to click. And over time it becomes addictive. One of the best things you can do to reign in your addiction is to keep track of how exactly how much time you spend on sites like Facebook and twitter. The best idea is to schedule your social media time and stick to that schedule no matter what. Close down your web browsers and remove application that could tempt you. Use a good old-fashioned alarm clock so that your phone doesn’t linger by your side and keep you from precious hours of sleep.Remember, you must be your own gatekeeper and make sure you regretting the important tasks accomplished every day. I don’t want to suggest that we can all go back to an age before computers. Yes Facebook can be great for catching up with your friends and family. Yes Twitter can be fun and amusing. The only part is that you have to know what you’re dealing with. Social media is the equivalent of candy for the brain. Yes it’s good to get a sugar rush once in a while. But if you do nothing, but live on chocolate doughnuts, you’re going to be too healthy. The meaning of spirituality has developed and expanded over time, and various connotations can be found alongside each other.Spiritual is the adjective form of the word spirit which comes from the Latin word for "breath," and means the thing that animates life. Spiritual can be used to talk about anything that goes beyond mere physical existence, from ghost spirits to religious feelings. As a noun, spiritual describes a religious song originating in the African-American culture of the American South. The path to spirituality starts with curiosity. It is possible only if one thinks about the existence of the world. There are so many things for which Science has no answers as of now. Spirituality is a science beyond science. In the initial stages of spiritual development, one may develop ideas that are contrary to the normal beliefs and religion, but with time the same person realizes that whatever exists in the world has a reason. So, he will start accepting the normal beliefs as well as the religion and when he reach a stage where he is able to fully connect the material existence and soul existence through his own thoughts then the person becomes truly spiritual and hence enlightened. How do we describe a flower, By its colour or fragrance?. Intact, by both. It is not only its beautiful colour that fills our hearts with joy but also and essentially the captivating and exhilarating fragrance it emits into the air. Similarly , a man is not only what he looks like- his complexion, clothes, physique etc, but also what he speaks, does and think. apart from his exterior, it is essential to look him inside out to have his thorough portrayal. It is rightly said that all beautiful faces do not possess the hearts of gold, and all ugly faces do not possess a devil “s hearts. A golden pot may contain honey, so we can not judge people by their coats.. Being proud of his beautiful body, once a leopard bragged to a fox “Look at my skin, well decorated with spots. That makes me the finest specimen among animals “But the fox , as foxy he was, retorted : “ And more beautiful than you stand I, decorated so well, not in body, but in mind “ Bhim Rao Ambedkar “Unlike a drop of water which loses its identity when it joins the ocean, man does not lose his being in the society in which hje lives”. This Identity is one’s personality. It encompasses many things in its ambit. Many things mixed up to form a personality. Literally speaking, personality is made from the word to which we affix two suffixes, person +al+ity. Person means a living individual being. Adding al to it connotes having individual traits and suffixing ity to it further extends it to convey to have the states of being individual. So literally personality means to have distinct qualities or features which distinguish one person from the other from any other and so on. Human personality is not static piece of art that remains the same, but is dynamic and grows with the passage of time as an earthbound caterpillar goes into flying butterfly, so must human personality grow - both in mind and body. Mind is the CEO and the body is the servant that carries out the orders and the instruction sent by the mind. We can not have solid mind without solid body and without solid mind human body is useless. So finally the character of a person could not judge by external body , it should be judged by by his / her internal beauty. It is not necessary the person who has beautiful body has a good character and good attributes. Therefore by the physical appearance the mind of a person could not be judge. But the mind of a person can reflect hi / her body language. Therefore inside mind always reflects by the physical body of a person. So we should judge a person by his /her mind and physical body both. Generally it is understood that the mind is a controller of the body, and body is the servant of mind.